The America's Cup, first awarded in 1851, is the oldest trophy in international sports, and one of the most hotly contested. In 2000, Larry Ellison, co-founder and billionaire CEO of Oracle Corporation, decided to run for the coveted prize and found an unlikely partner in Norbert Bajurin, a car radiator mechanic who had recently been named Commodore of the blue collar Golden Gate Yacht Club. Julian Guthrie's The Billionaire and the Mechanic tells the incredible story of the partnership between Larry and Norbert, their unsuccessful runs for the Cup in 2003 and 2007, and their victory in 2010. With unparalleled access to Ellison and his team, Guthrie takes listeners inside the design and building process of these astonishing boats, and the management of the passionate athletes who race them. She traces the bitter rivalries between Oracle and their competitors, including Swiss billionaire Ernesto Bertarelli's Team Alinghi, and throws listeners into exhilarating races from Australia and New Zealand to Valencia, Spain. 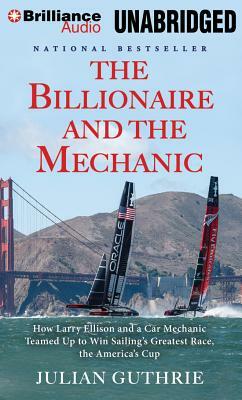 With new television coverage and huge media, the America's Cup is poised to be bigger than ever, and The Billionaire and the Mechanic is a must-listen for anyone interested in the race or this remarkable story.